Part Used & Method for Pharmaceutical Preparations: The roots are dug in late autumn. After the fibrous roots have been removed, the roots are laced, or smoked, with sulfur and cut into slices. Meridians: Liver, heart and spleen. 1. Syndromes due to deficiency of blood. Chinese angelica root (Danggui) is used with White peony root (Baishao), Prepared rehmannia root (Shudihuang) and Astragalus root (Huangqi) in the formula Siwu Tang or Danggui Buxue Tang. 2. Irregular menstruation. Chinese angelica root (Danggui) is used with Prepared rehmannia root (Shudihuang), White peony root (Baishao) and Chuanxiong rhizome (Chuanxiong) in the formula Siwu Tang. 3. Dysmenorrhea. Chinese angelica root (Danggui) is used with Cyperus tuber (Xiangfu), Corydalis tuber (Yanhusuo) and Motherwort (Yimucao). 4. Amenorrhea. Chinese angelica root (Danggui) is used with Peach seed (Taoren) and Safflower (Honghua). 5. Uterine bleeding. Chinese angelica root (Danggui) is used with Donkey hide gelatin (Ejiao), Mugwort leaf (Aiye) and Fresh rehmannia root (Shengdihuang). 6. Pains due to stagnation of blood: a) pain caused by external injuriesChinese angelica root (Danggui) is used with Safflower (Honghua), Peach seed (Taoren), Frankincense (Ruxiang) and Myrrh (Moyao); b) pain caused by carbuncles and furunclesChinese angelica root (Danggui) is used with Moutan bark (Mudanpi), Red peony (Chishao), Honeysuckle flower (Jinyinhua) and Forsythia fruit (Lianqiao); c) postpartum abdominal painChinese angelica root (Danggui) is used with Motherwort (Yimucao), Peach seed (Taoren) and Chuanxiong rhizome (Chuanxiong); d) wind-damp obstruction (rheumatic pain)Chinese angelica root (Danggui) is used with Cinnamon twigs (Guizhi), Spatholobus stem (Jixueteng) and White peony root (Baishao). 7. Constipation due to dryness in the intestines. Chinese angelica root (Danggui) is used with Cistanche (Roucongrong) and Hemp seed (Huomaren). Cautions & Contraindications: The head of the herb is more effective for nourishing blood; the tail is good for moving blood; and the body is used to invigorate and nourish blood. 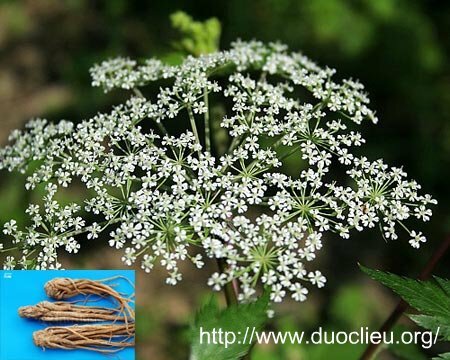 Chinese angelica root (Danggui), when mixed with wine, can enhance the function of invigorating blood. It is contraindicated in cases of excessive dampness in the stomach and spleen, and of diarrhea or loose stool.